When damage to a utility pole is caught early, it can be treated to halt rot, decay or insect damage from further weakening the pole. Poles that are inspected regularly and treated can have significantly longer lives than those that are not. Inspections will also help identify failing poles that need to be immediately replaced, as well as potential NESC violations. Downed poles can disrupt electrical, telephone, internet and other services, impacting customers, and can be a safety hazard for line workers, homeowners and pedestrians. The takeaway: any liability you assume as an asset owner is likely greater than the cost or resource impact of proactively addressing issues. Regular utility pole inspections to measure rot or strength can ensure that the poles you own are sturdy enough to handle their load, and will give you an idea of how much longer they can be expected to last. Visual inspection. Performed with the naked eye, the field tech looks to see if there visible rot or decay in the pole. Are there cracks, holes, burn marks or other imperfections in the structure? These things can significantly impact a utility pole's ability to handle stress. Soil test. Take a look at the ground surrounding the pole. If it is soft, loose, or wet soil, it may have problems supporting the pole, particularly through changes in stress. Also, how deeply is the pole buried? Is there evidence that it used to be buried deeper than it currently is? If so, the pole may not be planted solidly enough. Hammer test. The inspector strikes the pole sharply with a hammer, starting at the bottom. This is continued every few inches, up to about six feet. The resulting sounds from the utility pole can indicate its structural integrity. Sturdy, solid wood produces a clear, resonating sound. At places where there may be rot or decay, the wood will produce more of a dull thud. The hammer will also rebound more sharply on solid wood. Bore test. If any points of probable decay are found, the inspector bores into them with a drill. This measures the level of decay within the pole. 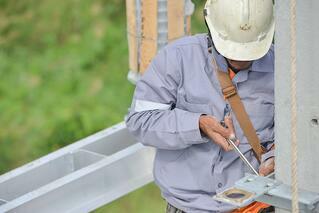 Utility pole inspections to measure rot or strength are essential for any asset owner. With proper treatment and periodic inspections, your poles will stand tall and strong for years to come.